Mathematical card effects offer both beginning and experienced magicians an opportunity to entertain with a minimum of props. 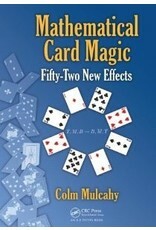 Featuring mostly original creations, Mathematical Card Magic: Fifty-Two New Effects presents an entertaining look at new mathematically based card tricks. Practice a handful of the introductory effects and, in no time, you’ll establish your reputation as a "mathemagician." Delve a little deeper into each chapter and the mathematics gets more interesting.